Ira Lee Smith, 91 of Herrin, passed away 3:35 a.m. Saturday, June 16, 2018 at Shawnee Christian Nursing Center in Herrin. Lee retired after 28 years from the U. S. Post Office in Herrin. 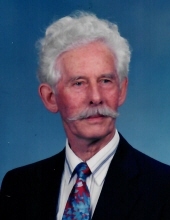 He was a member of the Community of Faith Church in Marion; a member of the U. S. Postal Union; veteran of the U. S. Navy during World War II serving in the South Pacific. Lee loved to play Bluegrass music. Lee was born October 22, 1926 in Freeman Spur, IL to Perry Edward and Cannie (Briscoe) Smith. Lee was united in marriage with Catherine L. (Schlink) Vaughn on November 23, 1969 in Herrin, IL. She preceded him in death on December 26, 2006. Surviving are two daughters and sons-in-law, Sharon and Kenneth Penrod of Herrin, Susan and Bob Kerley of Herrin; son and daughter-in-law, William R. and Cathy Vaughn of Herrin; ten grandchildren, Russell Allen, Lonnie (Robin) Beltz, Perry Smith, Linda Lee (Doug) Jackson, Sharon Marie “Cookie” Burgess, Jon (Tracey) Vaughn, David Lee Yount, Amanda Smith, Destanie (Zac) Taylor and Rachel (Tim) Meier; thirty great grandchildren and twenty great-great grandchildren. He was preceded in death by his wife, son, Bruce Smith, parents, three sisters, Lena Harbuck, Eva Koch and Edna Fozzard, and six brothers, Wayne Smith, Pleasant Smith, Earl Smith, Edward Smith, Ivan Smith, and Melvin Zea Smith. Services will be 1:00 p.m. Wednesday, June 20, 2018 at Meredith-Waddell Funeral Home in Herrin with the Rev. Dr. Troy Benitone and Rev. Ralph Brandon officiating. Visitation will be from 11:00 a.m. until 1:00 p.m. Wednesday at Meredith-Waddell Funeral Home. Interment with military graveside rites conducted by the Herrin American Legion, Carterville American Legion, Herrin V. F.W. Posts and the U. S. Navy Funeral Honors Detail will be in Herrin City Cemetery in Herrin. To send flowers or a remembrance gift to the family of Ira Lee Smith, please visit our Tribute Store. "Email Address" would like to share the life celebration of Ira Lee Smith. Click on the "link" to go to share a favorite memory or leave a condolence message for the family.